Oaklins DeSilva+Phillips (ODP) advised MJH Associates‚ Inc. (MJH) in its acquisition of major market media assets from the UBM Life Sciences Group of Informa PLC (INF.L). The transaction consideration was in excess of $100 million. “This acquisition rounds out a very robust portfolio of health care franchises assets,” said Roland DeSilva, Co-Founder and Chairman of Oaklins DeSilva+Phillips. “There is no other privately-held media company that serves such a wide array of stakeholders in health care. We were very proud to represent MJH in this dynamic transaction,” DeSilva added. “This is a perfect home for these very valuable life science brands,” said Ken Karpay, Managing Director of Health Care at Oaklins DeSilva+Phillips. The acquisition of UBM Life Sciences Group assets includes iconic multimedia platforms in the health care, animal care, pharma sciences, and dental fields, as well as three pre-eminent veterinarian conferences. The integration of these brands will complement the existing MJH portfolio and, together, significantly extend access and engagement with meaningful health content. These new assets will form a new business unit within MJH called MultiMedia Healthcare, LLC. This combined entity makes MJH. Health care – Medical Economics, Patient Care, Practical Cardiology, Dermatology Times, Drug Topics, Ophthalmology Times, Psychiatric Times, Urology Times, Contemporary OB/GYN, Oncology, Dental Products Report and Managed Healthcare Executive. Pharma – Pharmaceutical Technology, LC/GC, Pharmaceutical Executive, Spectroscopy, BioPharm International and Nutritional Outlook. Animal Health – DVM360, Vetted and Firstline. Additionally, the animal health group produces the Fetch series of three live regional conferences. 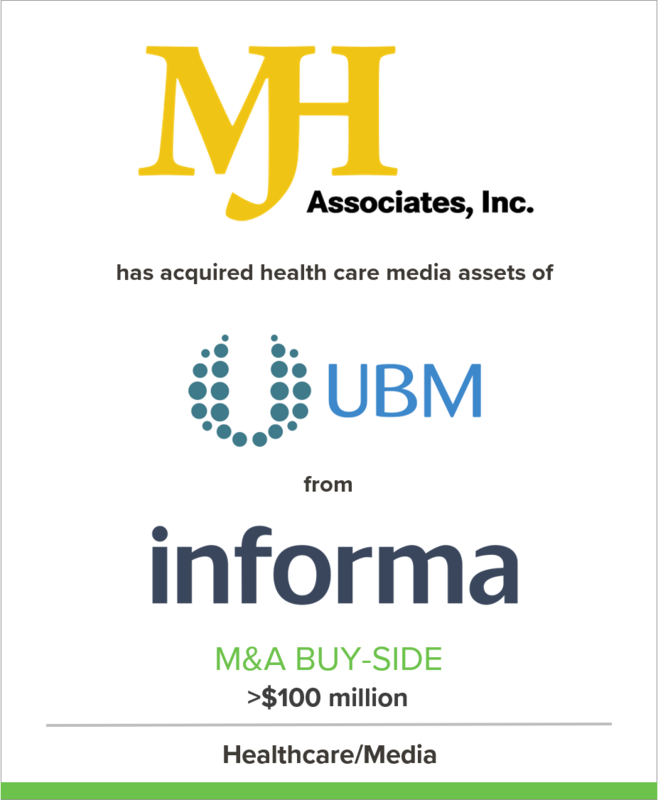 About MJH Associates, Inc. (MJH): MJH is the largest privately held, independent full-service medical media company in the U.S. dedicated to delivering trusted health care news across multiple channels. Over 600 MJH associates are dedicated to providing health care professionals with the information and resources they need to optimize patient outcomes. MJH combines the reach and influence of its powerful portfolio of digital and print product lines, live events, educational programs, and market research with customization capabilities of a boutique firm. Clients include world-leading pharmaceutical, medical device, diagnostic and biotech companies. For more information, please visit http://www.mjhassoc.com. About Informa Group PLC: Informa is a leading international Exhibitions, Events, Information Services and Scholarly Research Group with annual revenues approaching £3 billion. It helps commercial, professional and academic communities work smarter and make better decisions faster, through specialist content and intelligence, and opportunities to connect and learn.